The Best in Show award affirmed for me the wonderful synergy of combining sculptures and antiques. And so I continued to search out old treasures to use in my sculptures. You can see more examples of animals on antiques on Pinterest. Here are some reasons for that synergy. Antiques are survivors. They have histories. That means they have stories. We can’t always know these stories, but we can imagine. My favorites antiques have the rich patina that comes from use and age. I love the toys that have been pushed across miles of sidewalk, stuffed daily into satchels, and carried nightly to dinner tables. If someone has carved their initials underneath, so much better! The first owners have long since moved into the adult world, perhaps even retired from it, or even passed on to the next world. But the toys and tins wear their scars as a tribute to the use and love and attention they once received. Wikipedia defines patina as “accumulated changes in surface texture and color that result from normal use of an object such as a coin or a piece of furniture over time.” These changes in the surface give the toys and tins individuality and character. Which is what I seek in my sculptures as well. I wrote in one of my newsletters about the Art of Imperfection. When I sculpt I’m trying to catch a little magic. I seek character and personality, not perfection. I don’t mind when a little crack emerges in the clay, and I love the unpredictability of the glazes and stains I use. They go well with the “battle scars” of my preferred toys and tins. I love the texture and color of rust. Dents can make the surface of a toy more interesting. To my eyes, the little cracks, and stains, and rust and even the brokenness of the toy’s wheels or doors add to the charm and uniqueness of the piece. 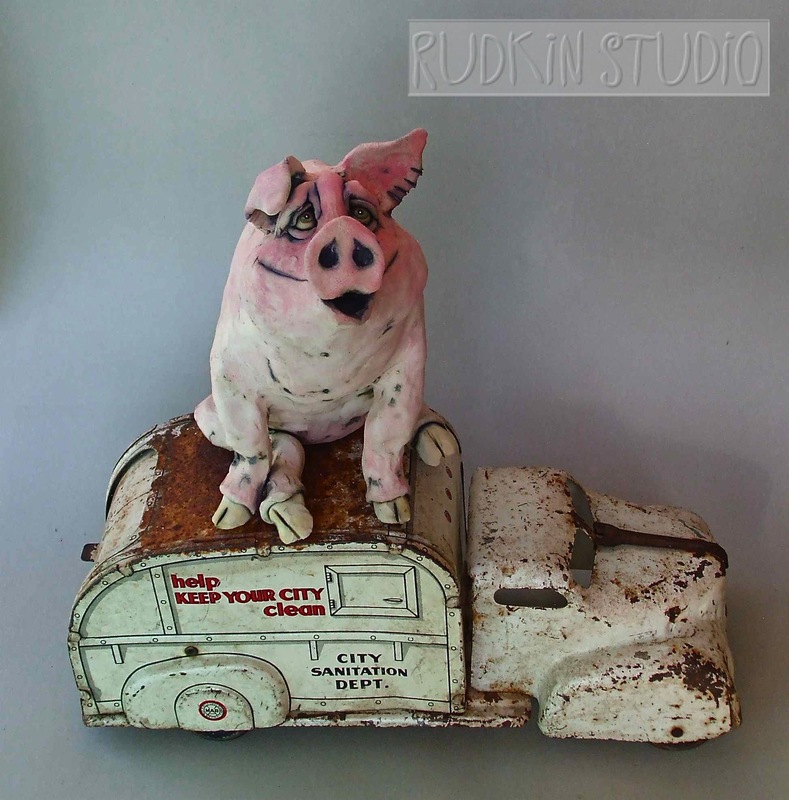 Doesn’t the unpredictable copper black stain on the pig and the rust on the garbage truck add to the joy of dirt-loving porker in the sculpture featured here? Little flaws can make a sculpture more lovable and sometimes the imperfections help bring the sculpture to life! 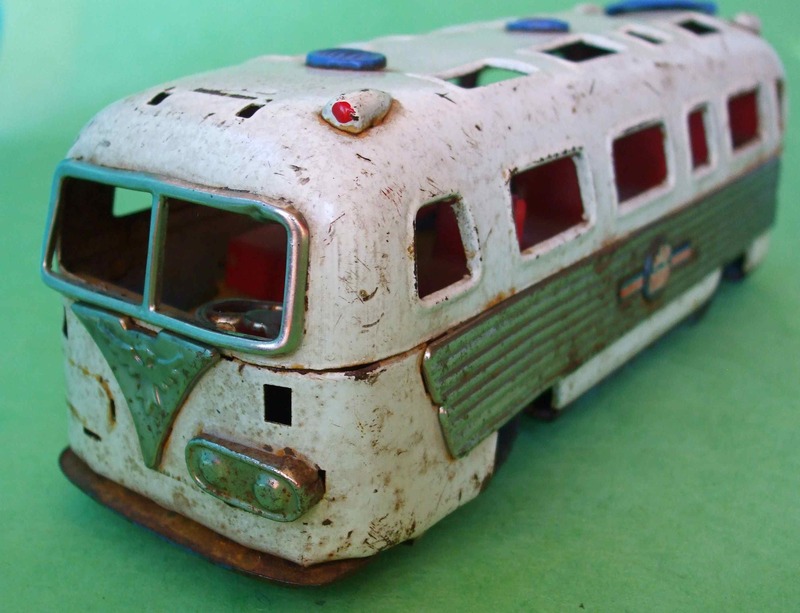 One day while wandering through an antique mall I found a little white bus I had to have. It was sitting on a shelf with a few other old buses but only the white one struck me as special. I am including a photo of that bus below, along with a similarly–sized bus purchased on ebay that made me pout when I opened its box. This is the bus that made me pout. I guess it’s nice enough with the all-metal build and bright graphics. But it isn’t SPECIAL in the same way. You can tell it was punched out and folded together along with a busload of nearly-identical toys. I’m not even sure a human hand touched it before it was taken from its packaging. Now check out my white bus. Look at the metal border around the front window. Look at that split pane of the windshield. Isn’t it amazing? Don’t you just love the silver panels that decorate the front and sides of the bus, each with detailed emblems. Can you see the rows upon rows of individual red metal seats inside? And the adorable steering wheel. 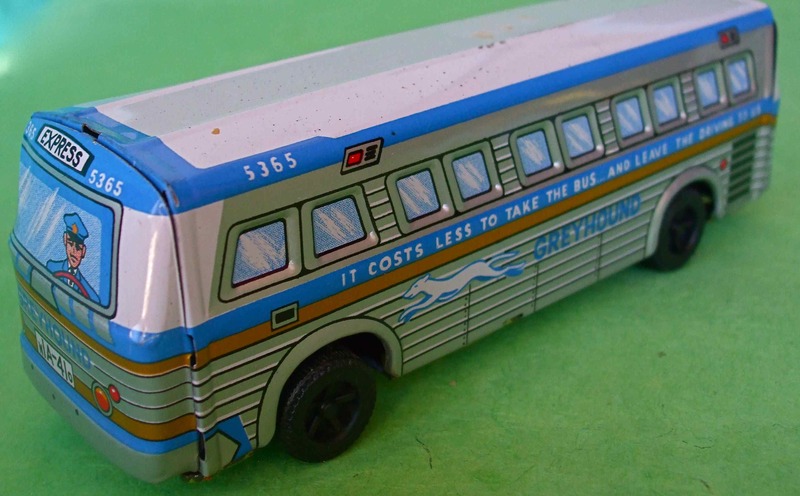 The bus also has crafted headlights and roof lights (two are lost, which makes the ones that remains more special). You can’t see in the photo but the one remaining original hubcap even has a daisy design! This attention to detail and individuality are hard to come by in most toys available today. A step back in time is a step into the days before effort was mercilessly weighed against profit. I don’t think these calculations existed in the artisan’s consciousness in earlier decades. The tooling on old door hinges burst with detail! The pulls of desk drawers presented opportunities to carve intricate angel heads. The scrollwork of a clock case offered the chance to inlay tiny pieces of wood. I try not to be a luddite but when I imagine antique malls in my grandchildren’s era, I worry. Inspiration is courted, not summoned and craftsmanship requires time. It’s a balancing act. 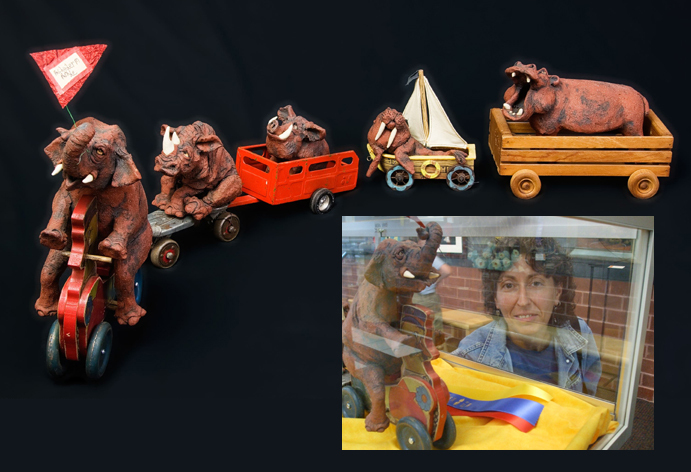 As a sculptor trying to “make a living” with my art, I certainly feel the press to produce. But when I enter the studio, I have to put aside mundane concerns and give the clay the room it needs to speak. It takes time and attention to infuse a little soul into every piece as best I can. And when the little soul I have courted in clay joins with an antique toy or tin, I feel as if the old story maybe has a new layer, a new chapter, and so a new life.